What will animal shelters look like in the years ahead – in 2030, 2040, 2050? What functions will they serve in their communities? These are questions that have not received much attention from shelter advocates, most of whom are too busy trying to save lives now to devote a lot of time to thinking about the future. Yet they are important questions. Actions that we take now will determine the nature of shelters of the future, and radically different outcomes are possible. Most industries and professions devote considerable attention to formal planning for the future, and animal sheltering needs to catch up in this regard. When people today do think about the future of sheltering, they tend to fall into one of two groups. One group sees the animal shelter as the center of a community “safety net for pets.” This safety net provides the usual animal-shelter services such as taking in lost and homeless animals and either returning them home or finding them new homes. It also reaches out into the community to work for things like breed-neutral ordinances, veterinary care for the pets of those who can’t afford it, protection of living spaces for community cats, and abolishing barriers to pet ownership such as restrictive HOA and insurance rules. A shelter system that is a safety net for pets sees its job as making a city or county a great place to live for pets and their people. The other common view of the future of sheltering is very different. People in this group believe that the best shelter is no shelter at all. They seek to reduce the need for an animal shelter by reducing intake to a very minimal number of animals. They emphasize spaying and neutering all the dogs and cats in the community, including community cats, and using education and pet retention initiatives to keep pets in homes. They believe that the ideal situation is for the municipal shelter to put itself out of work except for confiscations and emergency triage for injured and vicious animals. The small number of owner surrenders and healthy or treatable strays that still exist in this vision of the future will be handled by private-sector groups. Members of the second group argue that even if municipal shelters are put out of business through intensive spay-neuter of pets, we could still have a safety net for pets made up of smaller private non-profits that would be dedicated to things like helping community cats, offering dog behavior training, etc. The problem with that vision is that so far, the cities and counties that have the strongest safety nets for pets are the ones where the municipal shelter is the center of the net. There is a value in having one central institution that the public can look to, rather than an atomized group of organizations. And a safety net that centers on the municipal shelter is likely to have far more political support and influence than a group of small non-profits with no strong connection to each other. I want to look at these two groups in some detail, because they represent two stark choices in the future of sheltering. I’ll call the first group the Expansionists and the second group the Reductionists. The different worldviews of Expansionists and Reductionists seem to arise from their different views about some important issues in sheltering. One fundamental difference is on the issue of “pet overpopulation.” People who belong to the Reductionist group see pet overpopulation as still being a problem. People in the Expansionist group think that the problem today is not too many pets in the nation overall, but rather a pet distribution problem and a problem of insufficient adoption marketing. The differing views as to pet overpopulation have effects on how the two groups feel about other issues. Reductionists typically oppose transport, for example, because they see it as merely moving one community’s problem of excess animals to another community. Expansionists see transport as helping to solve the problem of uneven distribution of pets, particularly dogs, within the U.S. In deciding between an Expansionist and a Reductionist vision of the future, therefore, one of the first things we need to do is analyze whether we have a pet overpopulation problem. We have never had a formal, nationwide mechanism for collecting pet ownership and animal-shelter data. In recent years, though, data collection has improved, and we now have what seem to be fairly decent rough estimates. According to recent estimates, shelter intake in the U.S. today is about 7 million cats and dogs per year and about 1.5 to 3 million of that number are killed. Some of the animals who are killed are sick and untreatable, and “euthanasia” is an appropriate word to describe their deaths. Some dogs are dangerous and are in a sense “executed” for the safety of the community. Let’s assume for the sake of argument, though, that as many as 3 million cats and dogs who are currently killed in shelters each year are healthy or treatable and could be adopted. Does the fact that they die in shelters mean that we have a pet overpopulation problem? Expansionists look at the fact that people acquire roughly 15 million cats and dogs as pets each year and say that there is no pet overpopulation because there are far more people acquiring pets each year than the number of animals entering shelters. All we need to do to zero out shelter killing of healthy and treatable animals is to improve adoption marketing. The Reductionist sees things in a very different way. They define “pet overpopulation” to mean “more pets are coming into shelters than the shelters can place as live releases.” For reductionists, the fact that healthy and treatable animals are still being killed in shelters means that, ipso facto, we have a pet overpopulation problem. Now we get to what may be the central difference in philosophy between Expansionists and Reductionists. Expansionists see the primary cure for shelter killing as being adoption promotion, while Reductionists see the primary cure as being spay-neuter. This doesn’t mean that Expansionists only care about adoption or that Reductionists only care about spay-neuter. For most people, both programs are important. The difference is in the emphasis given to each program. If you talk to an Expansionist about adoption, they will tell you how shelters can use marketing to raise the percentage of pets that people acquire by adoption and create so much demand for shelter animals that the shelters run out of dogs and cats. They talk about large cities that have such a high rate of adoption that they must transport thousands of animals into the city each year for the many people who want to adopt, not shop. They see the animal shelter of the future as continuing this trend and bolstering it by becoming a one-stop shop for all the support a pet owner might need. The “safety net for pets” arises naturally out of this vision. If you talk to a Reductionist about adoption, they will say that adoption may be a good outcome for individual cats and dogs, but that adoption has historically not been shown to reduce shelter killing. This sounds counter-intuitive to Expansionists, but it was quite true – historically. Studies that were done in the 1990s in many shelters demonstrated that shelter killing tracked intake very closely. 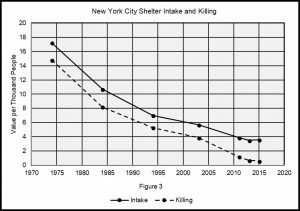 In looking at graphs of intake and killing from many individual shelters and some statewide data from the 1970s to the early 2000s, it is striking how closely shelter killing tracked intake. In recent years, though, that pattern has changed, and today we have begun to see live releases relative to human population increase – in other words, shelter killing no longer follows intake in lockstep at many shelters. This phenomenon was documented recently by Andrew Rowan and Tamara Kartal. 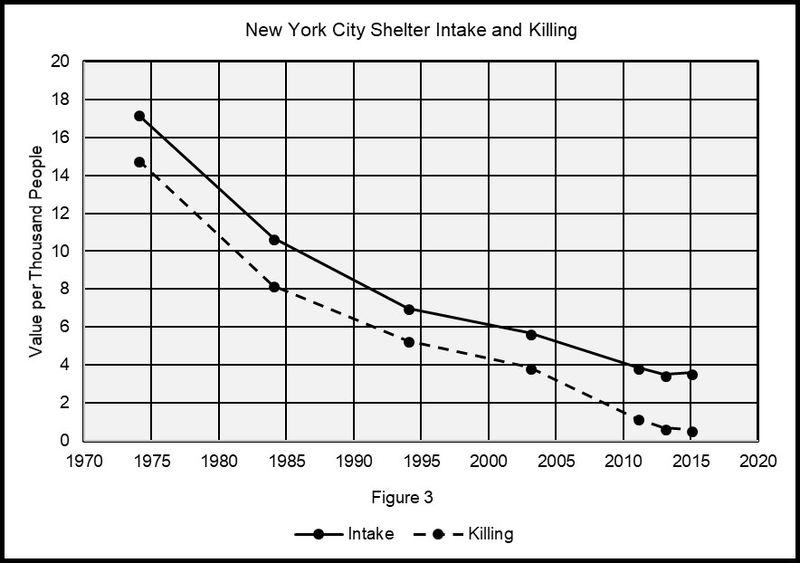 In this graph you can see how shelter killing moved virtually in lockstep with shelter intake until the early 2000s, when it began to diverge as the decline in killing accelerated and intake leveled off. To make sense of these trends, we must take a brief detour here to look at the history of the dog and cat markets from 1970 to the present. We start with 1970 because that is the earliest date for which we have rough estimates of national shelter statistics. The estimates from the 1970s were not very good, but the trends since then have been so marked that they more than compensate for the wide confidence intervals in the estimates. In 1970, average shelter intake nationwide was some five times higher per person than it is today. It is hard to see how a shelter could have adopted itself out of killing in those days because shelter intake alone was more than pet demand. And in addition to shelter intake there were large numbers of homeless animals in the environment, since it was not common in 1970 for people to sterilize their pets. There were lots of homeless animals in the street and a seemingly endless supply of puppies and kittens born each year. People who wanted a puppy or kitten generally had a friend, relative, or neighbor who could supply one for free. They had no need to go to the shelter. Animal-welfare advocates who were horrified at the high levels of shelter killing in those days – some 20 million or more dogs and cats are estimated to have been killed in shelters in 1970 — started a big spay-neuter movement, and they worked tirelessly. By the year 2000, we lived in a different world as far as homeless animals were concerned. Shelter intake had plunged and there were far fewer homeless animals in the environment. The spay-neuter movement had radically changed the supply side of the pet market. People reacted by beginning to value their pets more. The plunge in shelter intake was so dramatic that some parts of the country started to develop pet shortages. Some shelters in New England and in other parts of the north, where the spay-neuter ethic had been widely embraced and the climate and terrain helped limit breeding, started to run out of adoptable pets in the 1990s. Shelters in the southern part of the U.S. generally still had high intake, leading to the phenomenon of transport, which has literally gone a long way toward solving the distribution problem. The cat population differs from the dog population because we have a reservoir of cats who live in our communities without any clearly defined owners. Cat intake numbers have plunged at shelters along with dog intake numbers, though, which may indicate that the number of “community cats” is declining due to the success of spay-neuter programs. Spot shortages of cats are starting to be seen. One of the biggest effects of the plunge in shelter intake was that shelter workers in many places now had time to put their heads up and look around – they were no longer buried in an endless onslaught of animals, and they could start to think about how to better help the animals they were still receiving. One obvious way to save more animals was by increasing adoptions. The No Kill movement had always had adoption promotion as one of its central tenets, but by the late 1990s many people within the traditional shelter industry also wanted to improve adoption numbers. Because of the drastic changes that had occurred in supply and demand for pets, they no longer felt that adoption was just a game of musical chairs where finding a home for one homeless animal meant leaving another one in the lurch — there now seemed to be enough homes for all. A meeting of No Kill and traditional shelter professionals in 1999 started a movement for Open Adoption. Today, Open Adoption and the use of adoption marketing have resulted in public shelters in many cities and counties becoming the default place for people to acquire pets. When shelters improve their marketing, their live release numbers go up. And adoption rates in cities and counties that have established a culture of adoption prove that there are enough homes for every healthy or treatable animal that comes into a shelter today – although distribution is still an issue and there is a great need for more transport capability. With the proven success of adoption, why are Reductionists not more enthusiastic about it? Why do they still see intake reduction, and not adoption, as the key to the future of sheltering? Reductionists may give lip service to the desirability of adoption, but they seem to have a fundamental belief that animal shelters should not be involved in marketing pets. Creating a culture of adoption means that animal shelters must very deliberately go head-to-head with commercial breeders and compete for market share. Reductionists see this as beyond the scope of a shelter’s job. They point to the fact that shelters are traditionally a government function and argue that it is not the place of government to pick winners and losers in markets. Some Reductionists will say that animals are not commodities and that adoption marketing hawks them as though they were cars or furniture. Many Reductionists feel that only responsible people who have the resources to take care of a pet should acquire one, and that encouraging adoption results in unfit people adopting pets. And some Reductionists fear that if spay-neuter is not the centerpiece of lifesaving efforts, fewer people will sterilize their pets and the number of homeless pets will increase. The question of whether a person is an Expansionist or Reductionist has not been terribly important until recently, because it hasn’t been until recent years that shelter intake has fallen to a level where it has become possible to think of finding a home for every healthy or treatable shelter animal. The Rowan-Kartal article identified 2010 as the year when national statistics began to show that adoptions per thousand people were increasing, marking the end of the era when there were not enough homes available to reduce shelter killing through adoption. The phenomenon of adoptions per thousand people going up happened in many individual cities before 2010, but by 2010 the phenomenon was so widespread that it was visible in national statistics. Now that the change has occurred and is measurable, it is becoming imperative that we examine the two competing visions of the future presented by Expansionists and Reductionists and decide which way we want to go. If you ask an Expansionist where people in the future will acquire pets, they will answer “at the shelter! Everyone will adopt, not shop.” If you ask a Reductionist the same question, he or she is likely to give you a blank stare or deflect the question. Reductionists see reducing intake as the solution to shelter killing, and therefore they see questions about pet acquisition, particularly pet acquisition in the future, as not relevant to the issue of pets being killed in shelters. The Expansionist views the shelter of the future as a major player and perhaps the dominant factor in the pet market. The Reductionist views the shelter of the future, since it will hardly exist, as having no presence in the pet market. Let’s think about what these two differing futures would mean in terms of pet acquisition. In recent years shelters and rescues have provided about 35% of pet acquisitions. Adoptions today therefore account for a little over one out of three pet acquisitions. Under the Expansionist vision, the shelter has a prominent place in the community and makes it easy and pleasant for people to visit. With an emphasis on establishing a culture of adoption, such a shelter could supply 70% or more of a community’s pets. In the Reductionist vision of the future, where spay-neuter programs have reduced homeless pets to a tiny number, homeless pets would not be a factor in the pet market. The shelter of the future will become synonymous with sick and injured animals and vicious dogs, because that is all the shelter will take in. The shelter will be very small, and few people will visit it or even know where it is. Because there will be very few homeless pets, the percentage of pets acquired by adoption may sink from its current 35% to single digits. The two contrasting visions of the future of sheltering represented by the Expansionist and Reductionist camps would have very different effects on commercial breeding. If the Expansionist vision of the future of sheltering prevails and shelters become the “go to” place to acquire a pet, sales of pets by commercial breeders will decline. With 70% or more of pets acquired by adoption, it is very likely that social norms would put a lot of pressure on the few remaining commercial breeders to make their premises available for inspection, treat breeder animals well, and properly socialize the puppies. Acquisition of pets would largely be taken out of the commercial sphere and put into the hands of people whose primary concern is the good of the animals. If the Reductionist view of sheltering prevails, the continuing emphasis on spay-neuter over everything else will mean that pet shortages continue to worsen, which in turn will allow commercial breeders to thrive. Reductionists do not have a goal of establishing a culture of adoption, and with few homeless pets coming into shelters they could not have a culture of adoption even if they wanted one. There would be no barrier in the way of commercial breeders establishing themselves as the default way for people to acquire a pet. We would have commercial breeders, not shelters and rescues, holding the dominant place in the pet market. Once commercial breeders increased their market share to a high level their political power would be strong enough to allow them to avoid meaningful regulation, meaning that the cruelties of puppy mills would continue. Their political power would also allow them to put roadblocks in the way of animal-rights goals such as changing the “property” status of animals. Most animal-rights issues have had only modest success in recent decades in changing the public’s view of and treatment of animals. The most notable exception to that rule has been in the case of pets. People have come to see pets as part of the family. The No Kill movement has operated on the ethic that pets have a right to their lives and should not be treated like property. I think it would be a tragedy if the ultimate result of the No Kill movement was that the Reductionist view of the animal shelter, where shelters would take themselves out of the adoption market and leave the field open for commercial breeders, prevailed. Pets would go from being the brightest hope of the animal-rights movement to just another cog in the commercial abuse of animals. But the fact is that if we continue on our current course, we are headed for the Reductionist view of the future of sheltering. As we get better and better at making spay-neuter available and helping people keep their pets, shelter intake will continue going down and more and more communities will have shortages of adoptable pets. Transport will help ameliorate the shortages in the near term, but within 10 or 20 years we may find that there are no longer enough homeless animals in the U.S. to meet adoption demand. That future is coming, and we have not done anything to plan for it – we haven’t even thought about it. If we want the Expansionist vision of the future of sheltering, we need to start planning for it now. We need to start focusing on the pet market, on creating a culture of adoption in every city and county and increasing the animal-shelter-and-rescue percentage of pet acquisition. If we make the decision to go in the Expansionist direction, an issue that is sure to arise is where shelter animals will come from. Where will we get the supply to meet the high demand for adoption? Reductionists will argue that if we slack off on spay-neuter efforts, we will in effect be encouraging the birth of animals who will experience homelessness, even if for only a short period of time until they are adopted. They will argue that we have an ethical obligation to prevent unplanned births of cats and dogs, regardless of whatever effect that might have on the pet market. This is a very strong argument, and the answer is that we can continue to reduce the number of homeless animals born in the U.S. while at the same time ensuring a large supply of homeless animals for our shelters. All we have to do is expand our horizons. There is a whole world of animals who need saving, and importation of homeless pets from other countries is already being done on a small scale. Many of the recent imports have been from Korean dog-meat farms, and most of the dogs brought in have not been well socialized. This has given some people the idea that street dogs from other countries would be hard to place. Nothing could be further from the truth, because most street dogs are extremely well socialized and could fit right into American homes. There are also many litters of puppies and kittens born in the streets in foreign countries, who could be taken in by non-profits, socialized and cared-for, and sent to the U.S. when they are old enough. Some people object to the idea of importing pets because they think they will bring in diseases. The fact is, though, that hundreds of thousands of dogs are already being imported each year for commercial sale. So it is possible to import dogs safely, with the proper vaccinations and health checks. By the way, the fact that commercial breeders are already importing large numbers of dogs to sell as pets adds urgency to the need to make animal shelters dominant in the U.S. pet market. U.S. puppy mills are bad enough, but if commercial pet breeding companies can locate anywhere in the world, there will be no oversight on how they treat breeder animals and what kind of socialization the puppies and kittens receive. Another way to meet the future demand for pets would be for volunteers to breed litters of puppies and kittens to meet spot shortages as they develop. The purpose of the breeding would be to produce happy and healthy puppies and kittens. We already have a model for this type of breeding in the programs of some service-dog organizations that breed their own stock. Breeder animals would live as cherished pets in their homes, and the puppies and kittens would get excellent socialization and medical care, just as happens with service dogs. The emphasis would not be on pedigree or looks, but on health and temperament. Mixed breeds would be welcomed. Some Reductionists, when questioned about where pets will come from in the future, suggest what they call “responsible” breeders as a source. “Responsible breeder” is a term generally used for people who breed show dogs and cats as a hobby. The idea is that because they are not motivated by money, they will provide a good life for breeder animals and have healthy, well-socialized puppies and kittens to sell. Sadly, that is not the case. Showing animals is an expensive hobby, and selling puppies and kittens is a source of funds to offset the expense, so it can hardly be said that “hobby” breeders have no monetary interest in the sale of puppies and kittens. Furthermore, hobby breeders are breeding purebreds, which are notorious for genetic disease due to the overuse of inbreeding to produce a consistent look. Hobby breeders also participate in the deliberate perpetuation of genetic defects like brachycephalism. And many hobby breeders keep breeder animals confined in small cages or runs, just like commercial breeders do. The bottom line from this long article is that the future of sheltering may center on how we view the place of shelters in the pet market of the future. Adoption can become the dominant force in the pet market, which would mean that, with commercial breeders diminished in number and political power, animal-welfare policies for pets would be based on what is good for pets and their families, not on what is good for commercial animal exploiters. The alternative, if current trends continue unchecked and we increasingly have insufficient animals available for adoption, is that commercial breeders will become the dominant source of pets in the future, thus increasing the power of commercial breeders and giving them control over how pet-keeping and animal welfare are regulated. This is a very long blog, possibly the longest blog I’ve ever written, but it is also possibly the most important issue I’ve written about. This issue involves both traditional and No Kill sheltering, but it goes beyond that particular construct. The bottom line is that we are currently on a path that will take us to a place where I don’t think most of us really want to go. We – both No Kill advocates and the traditional shelter establishment — need to start thinking about the future of sheltering in a systematic way and developing programs and initiatives that will be good for animals in the decades to come. NOTE: The pet market is very complex, and I’ve left a number of the complexities out of this discussion in order to keep the blog a readable length. The complexity of the issues involved is all the more reason why the animal-shelter establishment needs to approach the issue of planning for the future of sheltering in a systematic and organized way. While I found this article interesting I cannot agree with all of it. Your generalizations regarding hobby breeders were wrong. As someone who walks in both worlds rescue and show including confirmation and sport you have overlooked the majority of hobby breeders to focus on just those who bred in a way you don’t like. Just as we need reputable ethical rescues, we need reputable ethical breeders and we have many in the hobby world. Who health test, choose not to breed dogs they have invested in emotionally and financially when they are not fit physically or temperamentally. Just as we should not discount rescues and shelters due to the bad practices of some your doing so of hobby breeders who work tremendously hard to improve their breed is disappointing while in the next breath promoting essentially backyard or designer breeding… with not mention of health testing. By the way you do not reduce health risks by mixing a few beeeds together, true mutts of years gone by did that yes but not necessarily what you are suggesting. I also work with service dogs and have attended several of Michelle Poulleits talks regarding guide dogs for the blind. Guide dog and other Sd breeding often comes from hobby breeders. Many of those organizations got their start and bring in new lines from hobby breeders. I agree with much of your article but I think your view of hobby breeders is very limited. Please also look to Puppy Culture to see how hobby breeders are working to develop their puppies to be the best pets possible. Signed a proud owner of a rescue mastiff and a show Russell terrier. A certified trainer who both charges for lessons and has for many years donated behavior work to local rescues, her local SPCA and open intake shelter. Susan Houser wrote an excellent blog on the two sides of pet over-population for the future. IF, in the next 5 years, we establish hubs in the states with huge, chronic, over-population and that is followed by an well-thought out S/N for the municipal shelters that are part of the hub – – most importantly with funding to be paid to the local veterinarians for S/N until they are swamped. Then Phase II – a mobile clinic. But this should not be a part of the conversation until the veterinarians are “slammed” in a good way with too many appointments, too long a waiting list and funding is still available. IF, we use the figures for our transfer program and our S/N programs as an example, then 2030 just might be the “tipping point” to move forward with a collaborative point of view that is close to reality – but not an extreme. PAAS is a transfer hub for homeless dogs/cats/puppies/kittens. We currently have 20+ municipal shelters and/or 501©3 rescues who’re our partners. And 3,500+ dogs/cats/puppies/kittens have made the trip to Dumb Friends League. So if you use a multiplier of 5 (each dog would have increased the population by 5 had they not been “fixed” ) – – you get this staggering number. And 5 is a conservative number. 3,500+ (DFL), 800+ local Spay/Neuters (Pets for Life and Pet Over Population grants). First year 4,300 fewer puppies/kittens. We can’t transfer our way out of over population – – we can transfer and S/N our way out of over population – it should be a long-term S/N commitment. If implemented, the transfer organization would be able to reach isolated communities and rescue/save the unwanted/homeless dogs and cats. And the transfer needs to be regular – at least twice a month – -30 – 40 pets. IF all the current transfer organizations, ie Pilots n Paws, Wings of Rescue, Fetch Fido a Flight – and those who transport going down the road – – – were backed up with S/N programs – – then – – by 2030 those of us who live in the puppy mill, backyard breeder, “can’t afford to “fix ‘em states (predominantly southern states) both the Reductionists and Expansionists would need to work together moving forward. For now, there’s a growing focus on transport – – thankfully – – but to be truly successful – it needs funders who “get the picture” and are willing to fund S/N programs in the transport regions for at least 5 years. And, true to form, after the 4th of July – – yes – we have lots of calls for lost pets – – and lots of people who’ve “found” lost pets and want to give them to us. As for adoption – – that isn’t even an option at this point for those of us who are faced with the Pet Over Population epidemic. We will know we’ve been successful when we can hold an adoption event and people show up to get a pet – – not drop one off when no one is looking!!! “We will know we’ve been successful when we can hold an adoption event and people show up to get a pet”…. Reading today that PAWS in Chicago advertised on tv, and other news outlets earlier this week. this past weekend had a successful event with 109 adoptions including 37 long term sheltered pets (or difficult to place). The event also garnered 250 foster applications. This type of event should be held monthly not annually.